It’s been a while and I wanted to reconnect with you and keep you posted on what has been happening in my world. 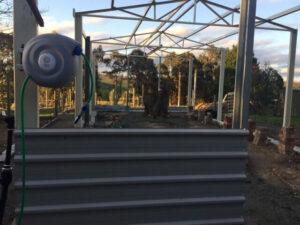 My dream of living in the country is taking shape now and I’m spending five days on the farm, leaving only a couple of days in Melbourne to catch up with my kids, parents, and friends. 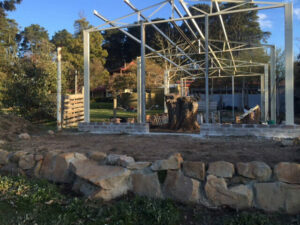 My partner and I have had a dream of living sustainably, growing our own organic fruit and vegetables so on March 26, 2016, we started building a Greenhouse. It’s been a ‘do it yourself’ project which has stretched my abilities beyond what I imagined! I have gone from ‘city girl’ to ‘country chick’, learning to dig and fill trenches, lay bricks, paint posts, dig and fill holes with soil and horse poo!! It has been a stretch of my comfort zone, to say the least, but hey, as they say, no stretch, no growth! I’m posting some photos so you can see and be part of our progress. I will keep you posted with more photos to come!! Next week we have invited 20 of our family and close friends to plant grapes since we want our friends to feel part of our project and next week will mark the culmination of all our efforts up to this point. I’m so grateful to be drinking Body Balance as I know that my body is being looked after on a cellular level and I have instant access to all the trace minerals that are missing our soils … I know that even when I’m eating entirely organic, home grown fruit and vegetables, I will still need to supplement and what better than feeding my body with an organic liquid whole food in a simple drink. One drink each day and I’m done! Over 126 trace minerals into my body, in my bloodstream in 6 minutes, in my cells in 20! Did you know that Fucoidan, a polysaccharide found in sea vegetables has an impressive variety of health benefits? These benefits come from fucoidan’s chemical composition, which closely resembles human breast milk, perhaps the most perfect immuno-modulating food on the planet! The Fucoidan content of several sea vegetables in Body Balance acts as an immune boost and modulator in much the same way as a mother’s first milk. Colostrum is like a download of the mother’s immune system ’s knowledge to the underdeveloped, fledgling immune system of the child. According to experts, Fucoidan acts the same way by literally boosting and modulating the function of the immune system, getting it back on track, back to the way it is supposed to work. Research completed by Dr. Kyosake Owa, an expert in sea vegetables, found that Fucoidan contains the same type of protective antibodies as those found in breast milk. Dr. Owa also found that fucoidan stimulates the production and action of vital immune cells and agents, improving the immune response to bacterial, viral parasitic and other types of invaders. In the latest research, Fucoidan has also been beneficial in preventing prostate cancer! In fact, here’s a great article for some further reading. Body Balance is a proprietary blend of Aloe Vera and 9 Sea vegetables, 3 brown, 3 green, and 3 red! As the month’s pass, I am committed to highlighting some of the benefits of each ingredient and why our bodies require it on a daily basis. Until then, I want to thank you in trusting your instincts and sourcing something that truly will make a difference to your health on a daily basis. Keep you posted on our Greenhouse progress!